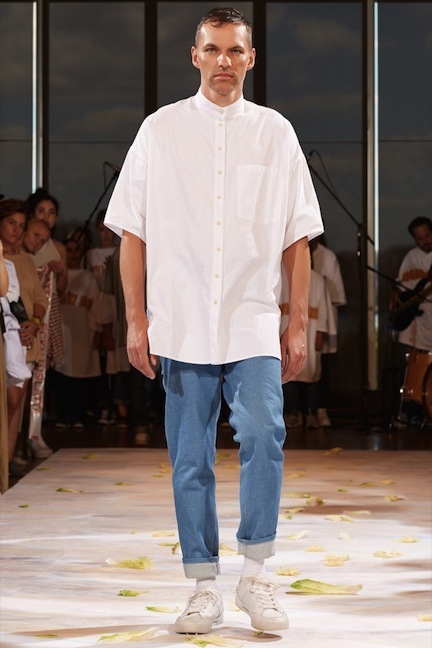 The show opened with a series of terribly captivating pieces made in a stiff light blue denim, each as sensational as the one before. 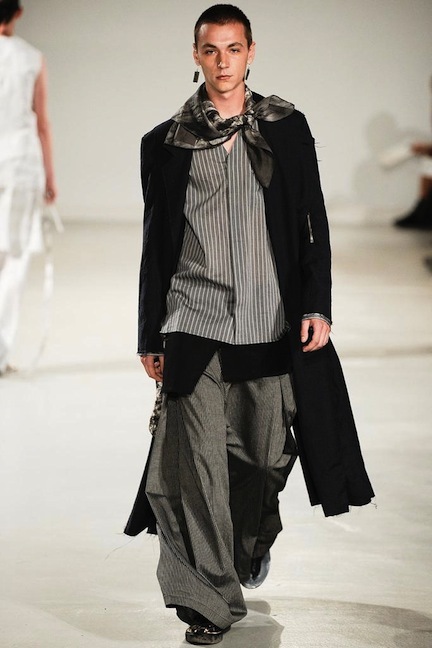 There was a wide-leg pant with flared fins that collapsed down the side seams into architectural flounces. Though rigid they looked amazing in movement. 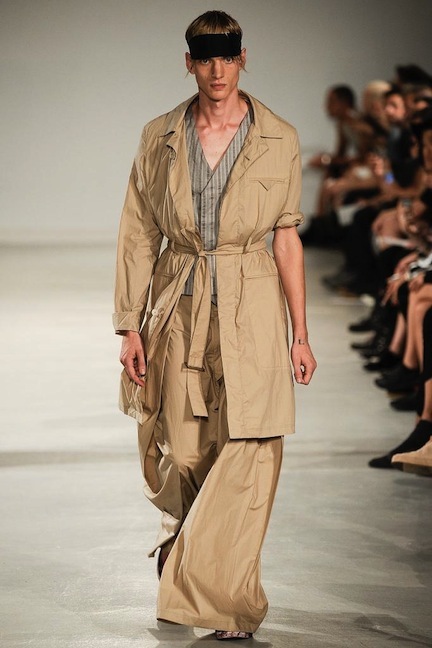 There was a fantastic coat, vaguely reminiscent in cut of Issey Miyake and in make of old Castelbajac (when they called him the “New Hermes”). It was quite covetable. 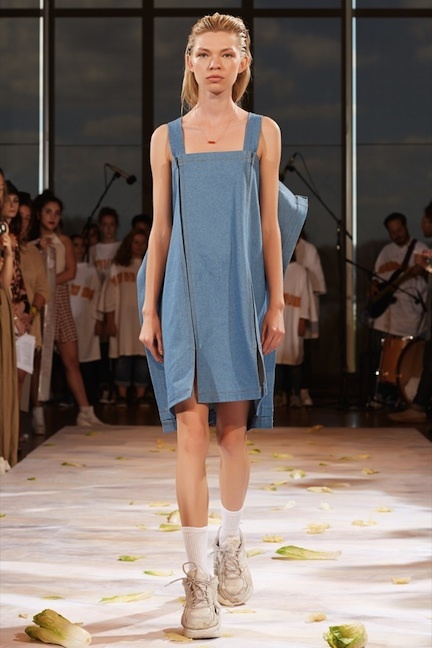 There was possibly the best piece in the collection; an apron dress constructed as a series of denim flaps that hung like curtains around the body. The curtains collapse and enclose you swaying gently to your step. It was sublime, I think I clutched my chest and deeply exhaled as it walked by. 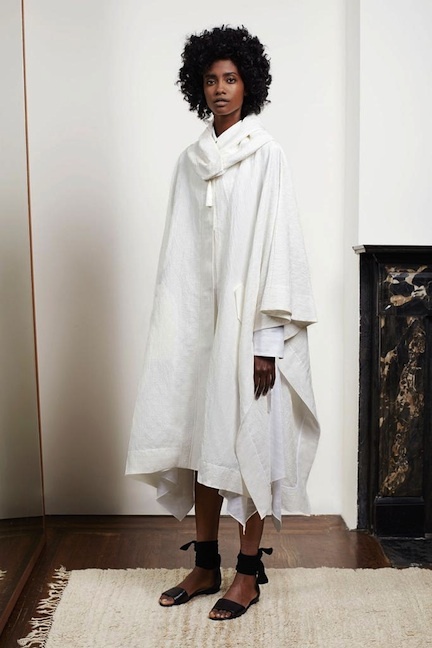 In fact, I held back gasps of marvel as that story played out and the collection turned its eye towards crisp white shirting expressed as a collarless white tunic, a rather perfect skirt with beautiful button closures at the waist, and a less identifiable caftan/jalabiyah with an interesting vent detail across the width of the garment below the abdomen. In succession they were quite powerful and heralded a breakthrough for the designers who have never realized such well-articulated and polished form. 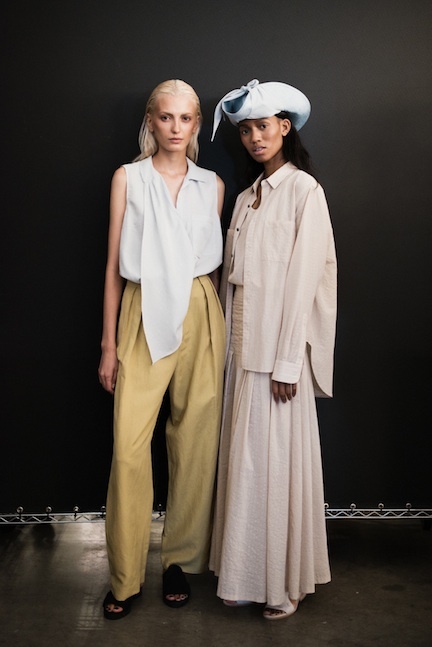 You would almost think with all of Eckhaus Latta’s experiments in taking things a part that they have also learned through that process a great deal on how to put them together. They’ve come to it on their own terms with their own prerogatives and interests. Just as they have deconstructed fashion their reconstruction is critical and astute. They experiment and they question and they have rethought materials and the sewing of garments in a compelling way. It is overt construction, used not to foster any familiar ideas of a garment but to push more challenging and abstract forms into our comfort zone. These are not designers who will slap a princess seam and a bow on a shift dress and send it down the runway. 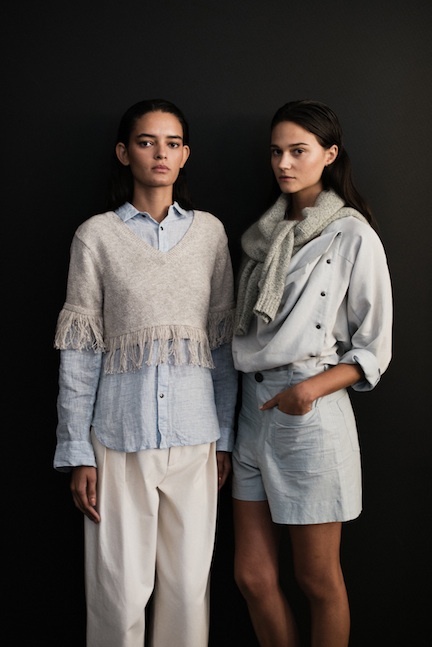 The clothes did segue back to some of their more familiar rustic themes which was focused on knits but also featured denim, this time dyed and softened. It was more in line with the sympathetic side they are known for though the knits did not have quite the same deliberate hand as the wovens from before. Engineering knit is a whole other science but it could be interesting to see how their newfound ideas on overt construction might apply. I suppose there is plenty of time for that come fall. 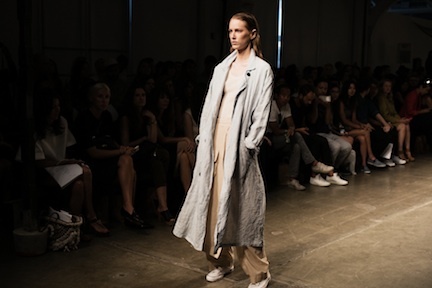 You can’t help but feel upbeat and perky after seeing Eckhaus Latta’s clothes. With their daring and courage they exude an infectious optimism, a trait I hope they never lose. 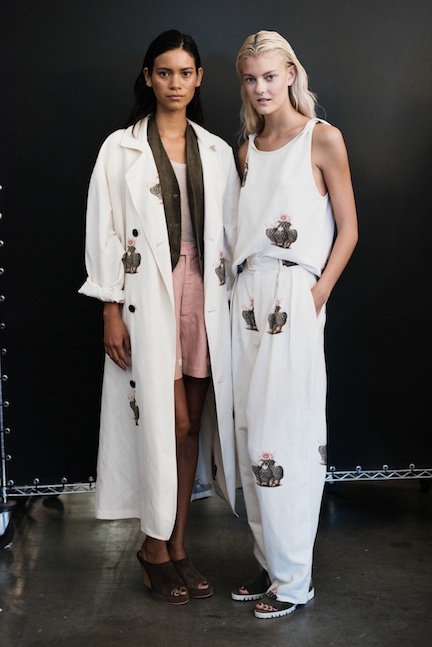 It’s pretty rare that new designers with such sure visions and bold talent come along but between Mike Eckhaus and Zoe Latta, and Hood By Air’s Shayne Oliver, it looks like New York’s downtown renaissance has some fashion megastars in the making. It’s always tricky when retailers launch their own wholesale label. They have to set their line apart from what they already stock while still embodying the experience of the whole store. It can go wrong for many number of reasons but often it’s because retailers treat the label like floor filler to plug the holes of their merchandising scheme and not as a separate and proper business that calls for proper clothes. 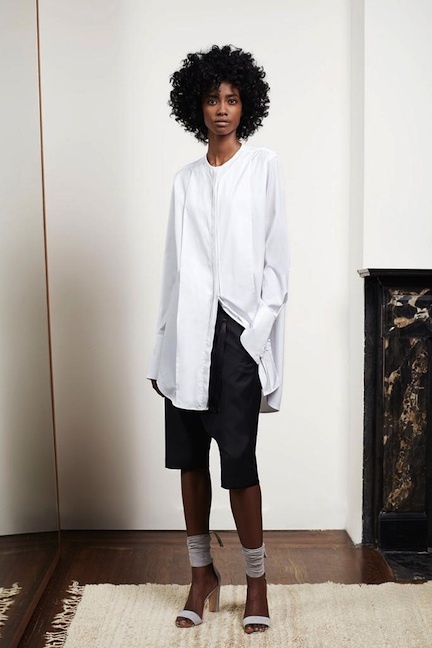 When it goes right, which it surely did for Creatures of Comfort, you get an accurate synthesis of a retailer’s identity into a collection and, more importantly, a studied and developed offering of wardrobe solutions. They are retailers after all and you’d hope that any store with such a distinct point-of-view would have a strong and empowering idea of their patrons. And if they are doing their job correctly they should have a pretty good insight on what his or her deepest needs and dreams are. And if they have a handle on that they should probably cut to the chase and make the clothes direct. It must be said that the clothes at Creatures of Comfort were more than proper. I know the mere mention of “world dress” can send you into a Pier 1 Imports nightmare but fend it off and hold on. Consider something like Japanese dress, not the orientalist affectation of a cherry blossom kimono or a geisha, but rather its radical power to deconstruct and reconstruct fashion as designers like Miyake, Yamamoto, and Kawakubo did in the ‘70s and ‘80s. Then consider South Asian, Southeast Asian and all the vastness of African dress and you get the idea. As Western fashion exhausts itself through endless self-referencing, world dress provides a wellspring of solutions derived by other ways of life, some now extinct. That alternatives to modernized and Westernized life should be so appealing at this point in time is anybody’s guess. In the ‘50s American sportswear designers constantly referenced world dress, particularly costumes of Japan and Southeast Asia and they came up with, what was in their context and time, some pretty radical ideas. They were based on economy. Why have the extra cost and labor of buttons? Just tie it. Why bother with the resource-gobbling construction of traditional dressmaking and tailoring? Just wrap it. These designers sourced a great number of innovations from across the globe and adapted them for the Western mode which simultaneously critically reassessed the shifting paradigms of modern dress. 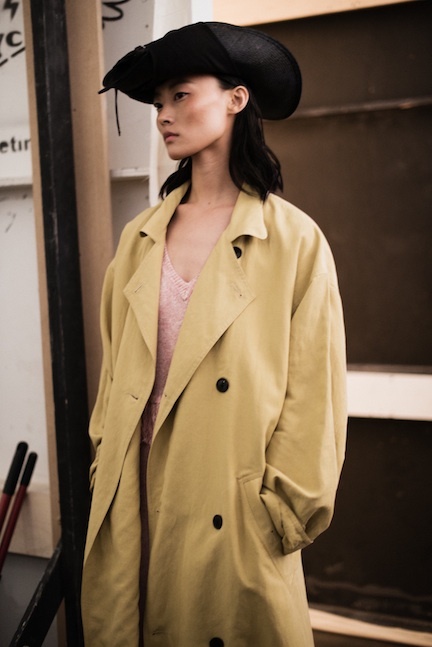 It was great go see Creatures of Comfort’s Jade Lai wrestle with the same ideas with her interpretation landing somewhere between McCardell and Issey Miyake’s Plantation with a good dose of British New Romanatics ala Westwood and Galliano mixed in. But my personal references aside, it actually read as a collection full of new classics. 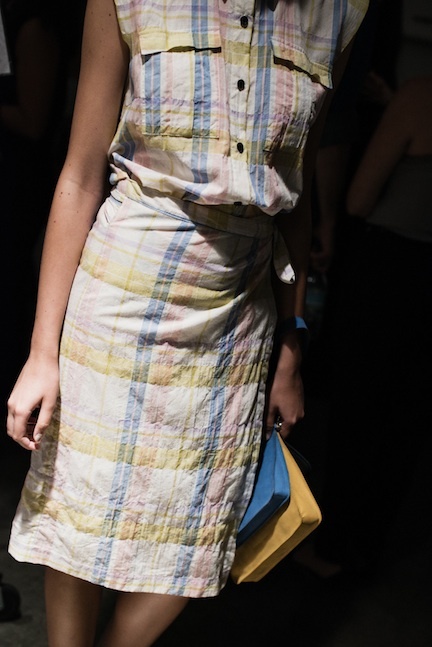 A skort with an extra-long wrapped panel was both a utilitarian and aesthetic adaptation of Southeast Asian wrap skirts keenly realized for urban life in New York. A long stripped linen car coat, sampled in a few covetable fabrications, seemed just as easy and necessary. There was a range of knit vests, skirts, and dresses that had ease and polish, particularly a knit dress with a placket running down the center back (it made for a memorable exit). And there was a major call for loose pajama dressing– novel today as fashion but obvious for its comfort and grace throughout the rest of the world. The collection shifted between familiar and foreign, always effortless and casual but highly refined with moments of splendor. It did not suggest a different world but perhaps a whole new one. It’s a pretty inviting one Lai has made for her and her customer which now exists well beyond the confines of her stores in L.A. and New York. “This is where I’m meant to be, she thinks” reads the ending to the prose, “where I’ll be for a while.” I can’t blame her and I don’t think many women will be able to, either. Images by Shawn Brackbill courtesy of Creatures of Comfort. Siki Im is as much a storyteller as he is a designer. His collections are narratives, sometimes autobiographical, always personal, and often laden with modern metaphors. These narratives can be complicated, so much so that Im provided a reference guide which this season included William Gibson, Jean Baudrillard and Disney’s WALL-E. The intrigue began well before the clothes came out. Printed in the show notes was a thesis on the implications of technology on human interaction and its effect on fashion. With advanced developments in personal computers, robotics and artificial intelligence, human interaction has theoretically become utterly avoidable. Through isolation, humanity risks being reduced to a mere concept, a “rational idealism.” But humanity is not rational, it is “idiosyncratic,” and the idea of human interaction disappearing altogether is, as Im says, “irrealizable.” Clothes, worn on the body, are rooted in human emotion and ultimately fashion “appraises” technology, giving it value rather than bending to its presence, “fashion lives beyond technology not within.” And so clothes become an increasingly important expression of our humanity. It’s a potent thesis not just for its philosophical and psychological implication but for the simple fact that it made for some pretty amazing clothes. 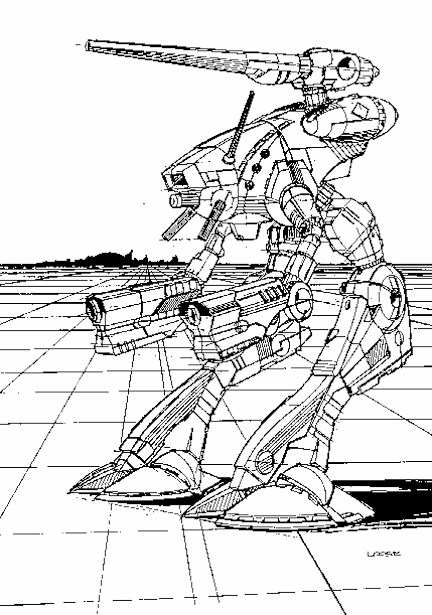 My personal favorite Robotech designs – J.L. What is modern dress in this technological age? Im addressed it by turning to his personal experience and took inspiration from the 1985 anime show Robotech. 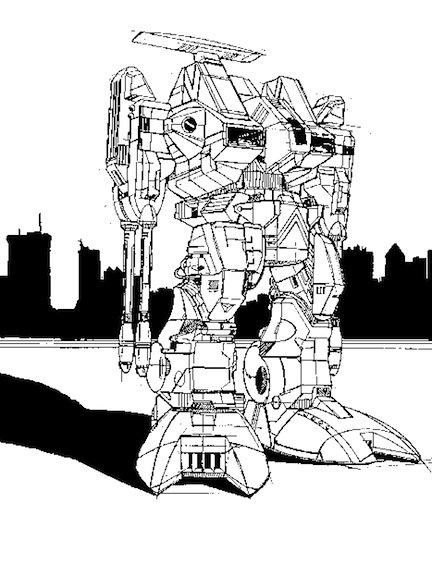 For those unfamiliar, Robotech was a Japanese sci-fi show about manned giant humanoid robots called Mecha which are used to fight an alien invasion. The show is especially known for its extremely intricate and stylized animation design which enjoys a huge international fan base of admirers who build their own 3-D model Mechas, often with a level of detail fit for an Industrial Light & Magic production. Im translated these robotic forms, essentially fantasy concepts for human body extensions, into garments. Showcasing his virtuous talent in cut and construction, he reverse engineered these bold designs into their fundamental geometry and applied them with Vionnet-like cunning to cloth. His translation is extraordinary. Im avoided any retro-futurist clichés like body armor or neoprene and the end result was a series of subtle and sensuous shapes built in linen, cotton and silk. His expert engineering is masked by the graceful ease of sumptuous, fluid and tactile fabric. It’s just the fix you’d need against the dispassionate machine. Last season Im was inspired by the German Krautrock music movement and this season he further indulged the relaxed line of the ‘70s. 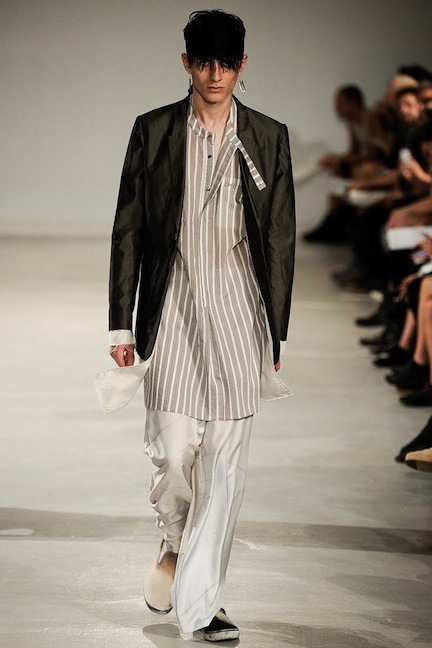 Elongated soft jackets in stripe and seersucker, “neoteric” medieval tunics, loose flowing pants in cotton voile and gossamer silk; it was a softer side of Im never seen before. 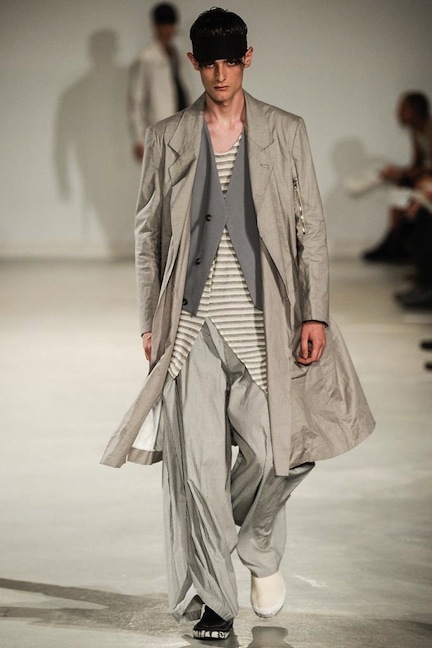 The collection was styled into the archetypal dandy, not unlike Quentin Crisp circa 1979 if he were dressed by Armani. Mixed in were streetwear memes which Im has touched on many times before. 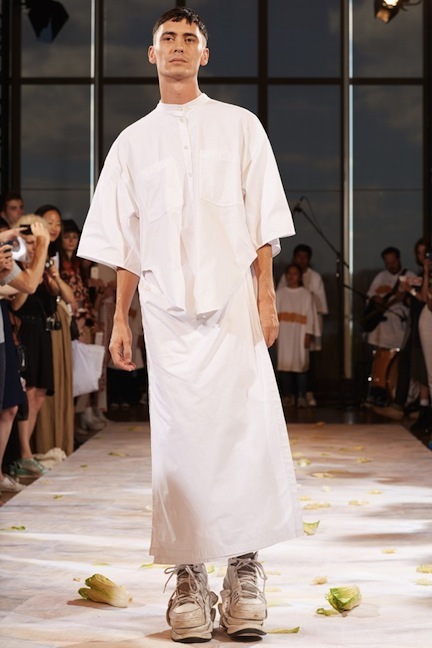 Both pastoral and aggressive, hyper masculine yet feminine, the contradictions presented as Im’s propositions on volume and soft dressing danced between these two archetypes was stirring. And if all the philosophizing grew too heavy, bursts of tie dye and fuchsia interrupted any overt seriousness. 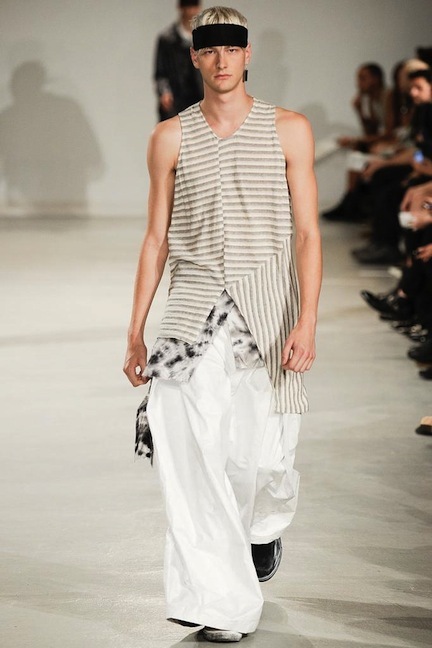 As the boys marched down the runway, as their pants poured over their legs with the rhythm and flow of a whirling dervish, and as the heavy electronic track boomed overhead, this season’s story turned out to be a page-turner. In the end Im’s narrative set up a powerful metaphor: that advanced robotic technology could be transmuted into an immensely humanistic expression. The designer is breaking down our stagnant ideas on futurist dress and imbuing them with a truth and a reality that is so breathtakingly gorgeous. Perhaps more than a storyteller Im is a poet. And beyond that he’s a world class talent.